Finally a REPUBLICAN with a SPINE! 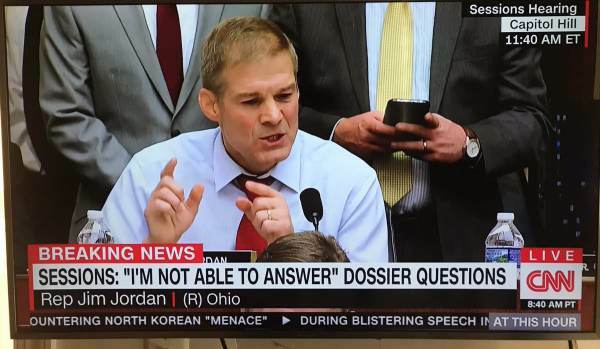 Rep. Jim Jordan (R-OH) grilled Attorney General Jeff Sessions today on the many apparent crimes connecting the Clinton Campaign, the Democrat Party, the FBI, James Comey and the Russian Dossier. Jordan grilled the Attorney General who was noticeably uncomfortable and irritated with the questioning. But the DOJ started one on President Trump when NO CRIMES were committed? Jeff Sessions needs to resign immediately.